Tim Burton's uphill battle back into the good graces of his early fans has taken a step towards realization. Frankenweenie, his latest in stop-motion animation, is a sweet story of a boy's love for his dog and the lengths he goes once his best friend has been taken from him. It's a film about dealing with death, though not in the most pragmatic of ways. Using skills learned in science class — see, something can come from paying attention at school! — the boy becomes a scientist worthy of his name. The results, though slight, are cheerful and heartwarming, and Burton's clout has regained a few inches towards winning us over again. 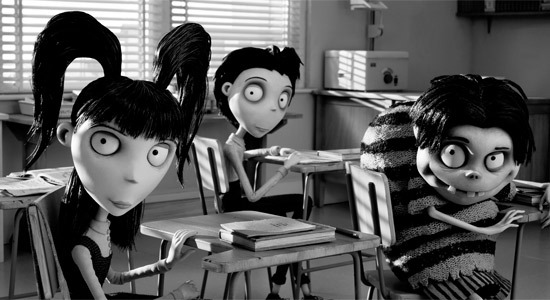 Frankenweenie is a feature adaptation of Burton's early short (from 1984) of the same name. The live action has been switched for nearly flawless stop-motion, the CG touches on the characters and their movements creating a fluidity that's becoming more and more apparent with this kind of animation. It isn't nearly as good here as it was in last month's ParaNorman, and the aspects where that film wins out over Frankenweenie doesn't even come close to stopping there. Story, character, and execution are just some of the big elements that keeps the previous film still at he top of 2012's animation pile. But Burton and screenwriter John August still do a solid effort expanding the director's very personal story to feature length. There's more here than just a boy coming to terms with death and resurrecting his pet. The expansion doesn't end with more character, either, something August and Burton always have a more than commendable way of handling. It isn't just that there are more characters here. They're more developed, exponentially more colorful even in the world of this black and white film. The love both these men have for classic horror characters and real-life personalities in the genre is undeniable, with certain characters clearly being designed after actors like Vincent Price, Peter Lorre, and Boris Karloff. Martin Landau voicing the Price-looking science teacher, Mr. Rzykruski, needs to be mentioned, as the marriage between sight and sound puts him with some of the great, Burton characters. It becomes something of a game trying to pick out all the references, but it becomes more difficult and less interesting as you realize there's very little being done with all these references. As with films like Dark Shadows, which August also wrote, it seems just enough to throw spits of familiarity at the screen. At times it's hard not to compare Tim Burton with Friedberg & Seltzer, though the gap in talent between them can't be understated. Burton is still a man of his craft. He's slipped in recent years, falling victim to the school of more color equals more colorful. Seeing the eccentricities and liveliness of the characters in Frankenweenie proves the exact opposite of that train of thought. For much of the movie, we're invested in this boy, Victor (voiced by Charlie Tahan), and his zombified companion whose doggy parts keep falling off. The humor is not only in the characters and the very suburban world Victor lives in, but the sheer friendship between the two leads. Sometimes it is just enough watching a boy play with his dog to lighten the mood of even horror stories like this. The film's handling of death never gets too dark for audiences of a certain age, though the flying, biting, and stomping monsters that proliferate in the film's back half might have some kids closing their eyes. Even with it feeling like expansion for expansion's sake and certain set-ups are never even allowed to pay off, Frankenweenie moves at a steady tick, bouncing between Victor dealing with Sparky, dealing with his parents, dealing with his friends who want to know his reanimation secrets, and even dealing with the community. All of these strands work well for the movie, each of them getting room to breath and find resolution in ways both natural and classically supernatural. Once the burning windmill shows up — just one of a dozen aspects Burton has used before — it's late in the film, but you're attention has rarely wavered. It's never gripped with a solid hand, but there's something revitalizing seeing a director like Tim Burton find his way back into the pleasant, the sincere, and even the cute that made his early films such crowd-pleasing modern classics. Frankenweenie is a movie about the fantastic, but its sincere and harmless way of storytelling lulls even the most cynical moviegoers into a place of comfort. After recent movies like Alice in Wonderland and Charlie and the Chocolate Factory, it's nice seeing Burton getting back to his roots. Even though it boils down to the man remaking himself instead of someone else, this very Tim Burton story is told in a way that will make even Tim Burton detractors proud. It isn't going to be a flash-flood of acceptance for Mr. Burton all over again, but telling a story near and dear to his heart was the first step in the right direction. Hopefully that heart can keep beating just as steadily. Excited for this. I try to avoid being cynical about Burton. If you keep judging his new films by his previous ones, nothing is ever going to satisfy. Btw, there's an inaccuracy in this article. John August didn't write Dark Shadows. It was written by Seth Grahame-Smith.